Chuck Davis died on Sunday and will be remembered for his contributions to dance, and for the many hugs and blessings of peace he bestowed during his decades in Durham. Davis was known to many as “Baba Chuck.’ He could bring people together regardless of their religion, skin color, and their backgrounds. “I still find it hard to put into words what I’m feeling. Chuck meant a lot to everybody,” said Angela Lee, executive director of Hayti Heritage Center which dedicated its dance studio to Mr. Davis. In 1983, Davis formed the African American Dance Ensemble. Besides working as a teacher and performer, Davis was also known for his presence at public events. He led Hayti Heritage Center’s annual celebration of Kwanzaa, where he stressed the importance of respect for the elders and tradition. 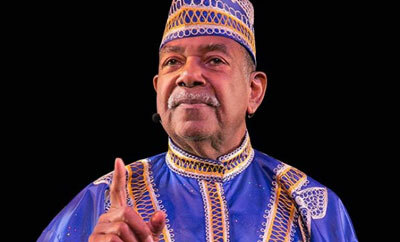 Davis recently celebrated his 80th birthday following the Kwanzaa celebration in January this year. He originally wanted to venture in the field of nursing. He engaged in working at a hospital in the Washington, D.C during the day and at night he would dance at different venues. Finally, he found a break-through when he attended Ho-ward University’s dance and theater department. In 1967, Chuck Davis started his Dance Company, and in 1977, became an instructor with the Brooklyn Academy of Music in New York, which led to the creation of Dance Africa. Every year, Mr. Davis made trips to Africa, giving dancers and choreographers the opportunity to perform in the United States. Davis joined the faculty of the American Dance Festival in 1974 and established his African American Dance Ensemble in 1983 where he introduced many people to African dance traditions. He would often be spotted in well-designed West African attire, with a big smile on his face and preaching peace, love, and respect for everybody. Davis was born and raised in Raleigh and was an only child, a condition he clarified in a 2015 interview that she never felt alone. Davis was born on the first day of the New Year in 1937. He has been celebrating his birthday in Kwanzaa and in downtown Durham, where he invites the whole community to attend. He always took advantage of the event to show his dancers and drummers the African tradition. Davis liked to say he was an “edutainer,” using his gift of dance to educate people of all races and nationalities. He was a fixture at the American Dance Festival, ADF, and has had a relationship with the festival dating back to 1972, when it was at Connecticut College. Davis has taught African dance and performed around the world. He has received incredible awards including the AARP Certificate of Excellence, the North Carolina Order of the Long Leaf Pine, and honorary doctorates from Medgar Evers College and Williams College.